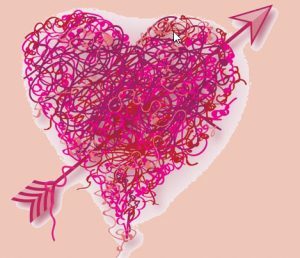 Axial Theatre’s 5th annual Twisted Valentines Festival will showcase seven original one-act plays that, through comedy, drama, and a skillful blend of both, probe the depths of joy, despair, and everything else that follows when Cupid’s arrows strike – or miss their mark. The Festival runs two consecutive weekends, February 8-10 and 15-17.
for Beatrice, and oh! what horrors he’ll suffer for her. Hell is for wimps. Today there will be clowns. unexpected turn when an incident from the distant past rears its head. limitations on torch-carrying? Will Paulie be able to finally rest in peace? Performances will take place on Friday, Feb. 8 and 15 at 8 p.m.; Saturday, Feb. 9 and 16 at 3 p.m. and 8 p.m.; and Sunday, Feb. 10 and 17 at 4 p.m. on the campus of St. John’s Episcopal Church, 8 Sunnyside Ave., Pleasantville, New York 10570. Tickets are $27.50 general admission, $22.50 seniors and students, and can be purchased online at Brown Paper Tickets, https://www.brownpapertickets.com/event/3921382. For more information: (914) 286-7680.